On March 26, 2010 in Tordas, Hungary the Amerikai Magyar Klub under the auspices of the Amerikaiak a Magyarokért Alapítvány (Americans for Hungarians Foundation) sponsored a planning conference to design a new cooperative movement in Hungary based on the pre World War II success model called the HANGYA cooperatives. The HANGYA cooperatives were initially financed by Grof Károly Sándor who selected Almási Balogh Elemér to create and manage them. He successfully grew the HANGYA to over 700,000 members and 2000 cooperatives, as well as creating 30 manufacturing facilities. These pulled Hungary out of its financial crisis and allowed it to compete with the multinational cartels. Attending the conference were past managers of these cooperatives, local farmers and business people as well as agricultural experts from the University of Debrecen and from the financial indutsry. Among those on the podium were Prof. Dr. Horváth János Doyen of the Hungarian Parliament, Balogh Gyula Elemér grandson of the founder, Ms. Dreisziger Stricz Zsuzsanna Co-President of the Foundation, Varga István President of the Taxpayers Association, Janzsó Tamás President of the Magyar Önkormányzatok Európai Szövetsége, Szerelmey Béla President of the HANGYA Együttműködés Association, and Szabó Zoltán. The grandson of Almási Balogh Elemér, the founder of HANGYA, hopes to cajole the leaders of the various renewed HANGYA movements in Hungary to cooperate with each other so that we can have a unified cooperative system that will allow Hungary to save and protect its agricultural industry. 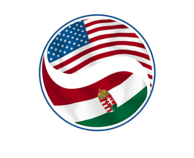 It would be helpful if the Hungarian government would facilitate this effort with new efficacious policies that are fair to the small farms (which will save and create many jobs), and a legal and tax structure that would allow Hungary to be competitive. Dr. Horváth János, past HANGYA cooperative leader, senior member of Hungarian Parliament, Truman-Reagan Award winner, and HANGYA Alapítvány Founder speaking about the new cooperative movement. 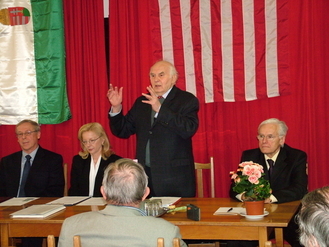 Also present on dais, left to right, Mr. Balogh, Dreisziger Zsuzsanna, Co-President of AMKA, and Mr. Varga István, President of the Hungarian Tax Payers Association all Kuratorium members of the HANGYA AlapÍtvány.